The visuals used in presentation are for facilitating the understanding of the audience, and not for attempting to win prizes in abstract modern art. An effective presentation is key to success of any new idea, project, design or product. Before reading this blog, please go through the following blog. ResultsLab is a very powerful tool to check the effectiveness of learning take away, you get to see how participants are applying learning in their day to day lives. A big worry for Learning and Development heads is “training effectiveness” and I must say with an engaging platform like Results Lab, this worry is taken care of. I would strongly recommend this as a tool. I would strongly recommend Resultslab to all programs that are interested in sustaining learning retention and measuring learning effectiveness among training-attendees. The tool removes the leakage of time and energy Training departments and supervisors have to invest in following-up with individuals' learning efforts. In fact, this tool takes care of the need of capturing the learning in such a fashion that the supervisors/trainers can focus on higher value addition to the learners. I love that it provides me with the ability to keep my learners engaged and connected to the learning even when they are out of the classroom. Additionally it is a great tool for both learners to track their progress and for Learning and Development to identify areas requiring further interventions. I would totally recommend it. It provides learning managers/consultants with actual quantifiable data to help strengthen the learning effectiveness measurement process. It was good to see participants put their learnings/experience into words, application of their learnings. It gave us an insight about how it had touched every participant in his professional and personal life and more importantly the success of the program. We have been able to use resultslab with a higher degree of confidence in our successive training modules. Ever since identifying training programs was on my agenda, I was always concerned about gauging the effectiveness of the training modules. My question got answered with introduction of resultslab. I do recommend resultslab. Amicorp engaged Ripples between April and June 2017 to deliver a key development initiative for our staff in Bangalore. One of the key outcomes we expected was quicker problem-solving through enhanced communication across all levels. The performance-consulting and training-design approach of Ripples stood out for us when we engaged with them. All consultants involved in this training-engagement made a genuine effort to gain an understanding of Amicorp’s business as well as the skills that needed to be developed to bridge some gaps in performance that we wanted to eradicate. Their design factored in a lot of practice, plenty of in-basket exercises to aid recall / retention of techniques / and adequate post-training contact to ensure a 100% learning transfer on the job. Overall, great value for our spend with concrete measures that we were able to showcase to all stakeholders involved. The fast-paced changes in the business world over the last two decades have made learning and development indispensable to organizations. There has been exponential growth in the south-east Asian corporations both in terms of the numbers of people and in the nature of work. This has lead to large-scale hiring, which in turn, brought in challenges of quality of workforce and productivity. More people also meant diversity in personality types, cultures, mindsets, preferences and many other aspects. The opportunities for employees increased and to be able to use these opportunities people needed to upgrade their skills and competence. The last few years have also seen recessions in specific industries and geographies. Organisations were compelled to take difficult decisions like upskilling, reskilling, downsizing, enforcing paycuts etc. Employees became more keen on developing their skills and attitude through time management training, certificate courses and behavioural training. In all of these situations, corporate training companies have had a pivotal role to play. Developing people for internal growth opportunities is just one of the many responsibilities an L&D expert has, the others include, cultural alignment, understanding of statutory compliances, awareness of internal processes and systems, aligning people and skills to organisational goals and other organisationaldevelopment related activities. Ripples Learning is a chosen learning partner for several corporations in both the private and public sector in India and several countries abroad(Bhutan, Singapore, Dubai, Turkey, Afghanistan and Iran are some of the countries we are delivering learning solutions in).We provide comprehensive learning solutions, off-the-shelf programs, public programs and consulting solutions. We have gone the extra mile to understand the similarities and differences between various industries and geographies, thereby bringing in unique and highly engaging training methodologies that break the monotony and accelerate the growth process. Our leadership development program is highly acclaimed internationally. DISCOVERY: The discovery phase consists of several steps to help Ripples’ consultants understandtheorganization, its culture, the nature of work, the hierarchy, history, pulse and core values of the organization. Several rounds of discussions and diagnostic tools are used to arrive at inferences. As a next step, the learning needs of the learner group are identified using a competency-based approach. 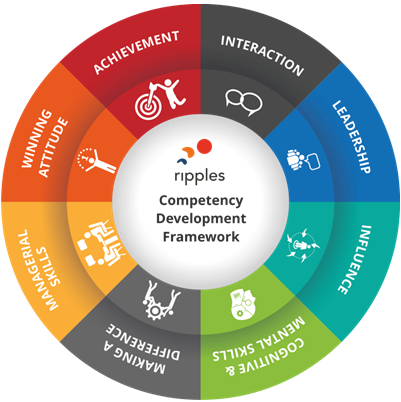 Ripples Learning has its own proprietory competency framework which is used for clients that have not yet done a competency mapping activity for their organization. DESIGN: Learning interventions are designed in a very scientific way to suit the exact learning outcome, target audience, geography and industry.Instructional design techniques are used to design the programs, thus ensuring high levels of receptivity and interest. For every learning objective, Ripples has multiple options of concepts, techniques and methodology itself to suit the industry and the learning group. DELIVERY: The training delivery phase (used synonymously with learning intervention delivery)is marked with unique delivery styles of highly experienced facilitators, some of which invoke thought, increase insight, encourage application and raise the energy levels of participants. All our learning interventions are delivered on adult learning principles and using cutting edge learning technologies like NLP, Accelerated Learning, Radiant Thinking, and Creative Learning techniques. All facilitators of Ripples Learning have international exposure and have conducted learning interventions in various geographies across the globe. Our sales and marketing courses are a splendid example of how our facilitators bring out the best in participants. EFFECTIVENESS & RIPPLING: Ripples Learning follows the Kirkpatrick methodology of measuring training effectiveness. There is a Level 1 guarantee to all clients which means the acceptance and liking of the program by participants is assured. Kirkpatrick Level 2 evaluation is also conducted for all programs through either tests or self-assessment by participants. Kirkpatrick Level 3 assessments areavailable for most programs though a proprietary tool called ResultsLab.Participants are able to implement and report the distinctions they have made in their workplace and life. This commitment to action is also reported and captured for clients in the ‘Training Impact Report’. The language, actions and demeanour of the participants give out a sustained signal of change leading to cultural alignment of the organisation.Exhaustive reports can be generated to assess relative application of learning objectives by different participants. PERSONALIZED COACHING: We realize that while Learning Delivery happens in a group setting, participants face individual challenges while putting ideas into action. Our unique services like ‘Ask the Coach’ and ‘Facilitator Call-back’ empowers individuals to create sustainable changes. We have a highly evolved backend that has been created and is constantly updated to include latest trends and changes in the business world. This backend consists of a robust competency matrix, which has eight competency headers and 31 competency areas. This competency matrix transcends boundaries of industry and scale. Each of the competency areas has several indicators of strength at three levels, beginner, experienced and expert. These indicators are used to arrive at learning objectives. These learning objectives form the basis of all learning interventions. LIVE E-Learning: We cater to organizations and individuals in smaller cities in India and other part of the world through our L.I.V.E (Live Interactive Virtual Education) sessions. All our programs are available through virtual classrooms conducted by certified facilitators. Outbound Experiential Learning: We offer exciting and adventurous experiential learning interventions that include trekking, water sports, yoga, games and other outdoor activities. These programmes are conducted in beautiful and rustic locations to enhance the experience.